Sentence • The two men pleaded guilty to knocking over an ancient rock formation. 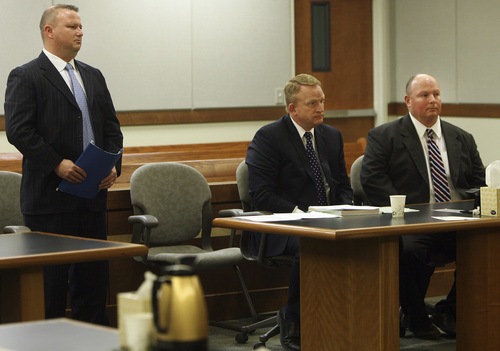 Geoff Liesik | Pool Photo Emery County prosecutor Brent Langston, far left, speaks during a court hearing Tuesday, March 18, 2014, for David Hall, standing, and Glenn Taylor, seated far right. Hall and Taylor admitted that they toppled a prehistoric rock formation, known as a hoodoo, during an October 2013 visit to Goblin Valley State Park. Taylor pleaded guilty to attempted criminal mischief, a class A misdemeanor, and Hall pleaded guilty to attempting to aid or abet criminal mischief, also a class A misdemeanor. 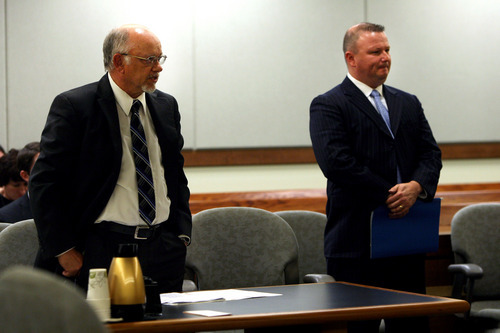 Glenn Taylor, right, stands with his defense attorney, Scott Card, during a court hearing Tuesday, March 18, 2014, for Taylor and his co-defendant, David Hall, seated at left. Hall and Taylor admitted that they toppled a prehistoric rock formation, known as a hoodoo, during an October 2013 visit to Goblin Valley State Park. Taylor pleaded guilty to attempted criminal mischief, a class A misdemeanor, and Hall pleaded guilty to attempting to aid or abet criminal mischief, also a class A misdemeanor. | Courtesy Emery County Jail David Hall Geoff Liesik | Pool Photo Glenn Taylor, standing, watches his defense attorney, Scott Card, make a change to court papers during a hearing Tuesday, March 18, 2014, for Taylor and his co-defendant, David Hall. Hall and Taylor admitted that they toppled a prehistoric rock formation, known as a hoodoo, during an October 2013 visit to Goblin Valley State Park. Taylor pleaded guilty to attempted criminal mischief, a class A misdemeanor, and Hall pleaded guilty to attempting to aid or abet criminal mischief, also a class A misdemeanor. Geoff Liesik | Pool Photo David Hall, standing, enters his guilty plea during a court hearing Tuesday, March 18, 2014, for Hall and his co-defendant, Glenn Taylor, seated far right. Hall and Taylor admitted that they toppled a prehistoric rock formation, known as a hoodoo, during an October 2013 visit to Goblin Valley State Park. Taylor pleaded guilty to attempted criminal mischief, a class A misdemeanor, and Hall pleaded guilty to attempting to aid or abet criminal mischief, also a class A misdemeanor. Geoff Liesik | Pool Photo David Hall enters his guilty plea during a court hearing Tuesday, March 18, 2014, for Hall and his co-defendant, Glenn Taylor. Hall and Taylor admitted that they toppled a prehistoric rock formation, known as a hoodoo, during an October 2013 visit to Goblin Valley State Park. Taylor pleaded guilty to attempted criminal mischief, a class A misdemeanor, and Hall pleaded guilty to attempting to aid or abet criminal mischief, also a class A misdemeanor. 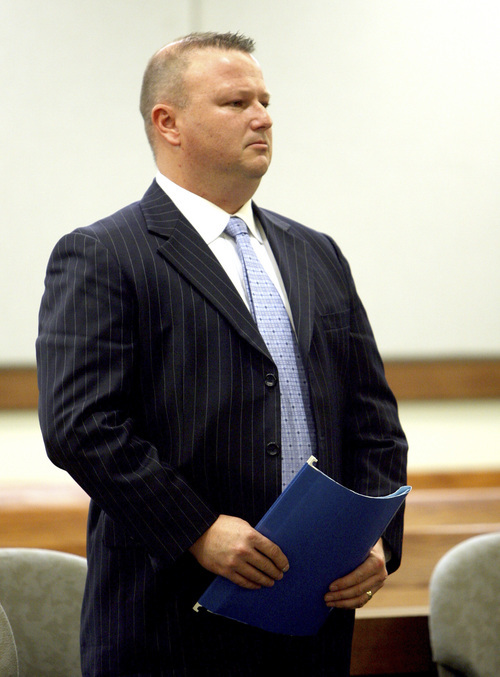 David Hall enters his guilty plea during a court hearing Tuesday, March 18, 2014, for Hall and his co-defendant, Glenn Taylor. Hall and Taylor admitted that they toppled a prehistoric rock formation, known as a hoodoo, during an October 2013 visit to Goblin Valley State Park. Taylor pleaded guilty to attempted criminal mischief, a class A misdemeanor, and Hall pleaded guilty to attempting to aid or abet criminal mischief, also a class A misdemeanor. 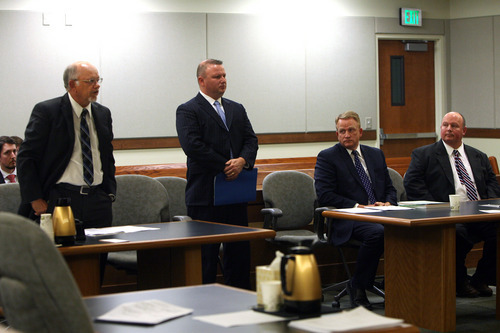 | Courtesy Emery County Jail Glenn Taylor Geoff Liesik | Pool Photo Glenn Taylor, right, stands with his defense attorney, Scott Card, during a court hearing Tuesday, March 18, 2014, for Taylor and his co-defendant, David Hall, seated at left. Hall and Taylor admitted that they toppled a prehistoric rock formation, known as a hoodoo, during an October 2013 visit to Goblin Valley State Park. Taylor pleaded guilty to attempted criminal mischief, a class A misdemeanor, and Hall pleaded guilty to attempting to aid or abet criminal mischief, also a class A misdemeanor. 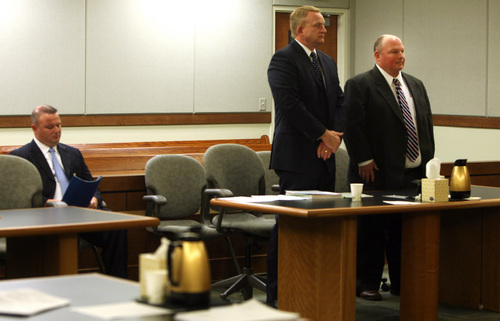 David Hall, standing, enters his guilty plea during a court hearing Tuesday, March 18, 2014, for Hall and his co-defendant, Glenn Taylor, seated far right. Hall and Taylor admitted that they toppled a prehistoric rock formation, known as a hoodoo, during an October 2013 visit to Goblin Valley State Park. Taylor pleaded guilty to attempted criminal mischief, a class A misdemeanor, and Hall pleaded guilty to attempting to aid or abet criminal mischief, also a class A misdemeanor. Geoff Liesik | Pool Photo Glenn Taylor, far right, stands with defense attorney Scott Card during a court hearing Tuesday, March 18, 2014, for Taylor and his co-defendant, David Hall, seated at left. Hall and Taylor admitted that they toppled a prehistoric rock formation, known as a hoodoo, during an October 2013 visit to Goblin Valley State Park. Taylor pleaded guilty to attempted criminal mischief, a class A misdemeanor, and Hall pleaded guilty to attempting to aid or abet criminal mischief, also a class A misdemeanor. 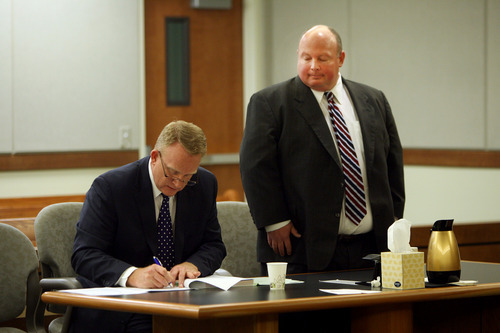 Geoff Liesik | Pool Photo Emery County prosecutor Brent Langston, left, speaks during a court hearing Tuesday, March 18, 2014, for David Hall, right. Hall and his co-defendant Glenn Taylor admitted that they toppled a prehistoric rock formation, known as a hoodoo, during an October 2013 visit to Goblin Valley State Park. Taylor pleaded guilty to attempted criminal mischief, a class A misdemeanor, and Hall pleaded guilty to attempting to aid or abet criminal mischief, also a class A misdemeanor. Castle Dale • Utah&apos;s so-called goblin topplers, Glenn Tuck Taylor and David Benjamin Hall, may have to shell out thousands to pay for warning signs telling future visitors to Goblin Valley State Park to leave the rocks alone  advice, Taylor said Tuesday, he wished they had followed last year. The men were sentenced Tuesday afternoon to a year of probation and no jail time after pleading guilty to knocking over an ancient rock formation in the state park. They will be required to pay an amount yet to be determined, which the state will use to erect warning signs throughout the park, officials said. 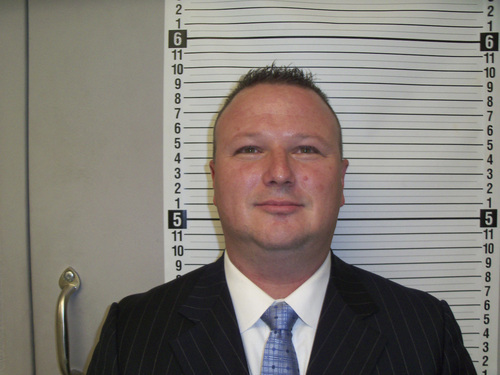 Taylor, 45, who physically pushed over the hoodoo, was charged in Castle Dale&apos;s 7th District Court with third-degree felony criminal mischief. Hall, 42, who videotaped the incident, was charged with aiding and assisting in criminal mischief, also a third-degree felony. Both charges were punishable by up to five years in prison had the men been convicted. But each pleaded guilty Tuesday to lesser class A misdemeanors  Taylor to criminal mischief, Hall to attempted criminal mischief. 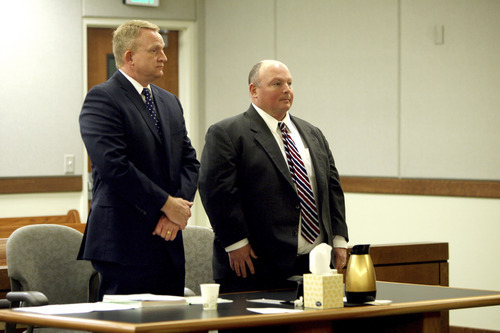 After the hearing, as Taylor was leaving the Emery County Sheriff&apos;s Office, where he had been finger printed and processed into the county&apos;s offender registry, he apologized for his actions on that October day. "We wish we hadn&apos;t done it," he said. "We&apos;re sorry." Their pleas were held in abeyance, which means that if the men stay out of trouble for the next year and comply with conditions ordered by the court, the cases will be dismissed. Judge Douglas Thomas didn&apos;t impose too many conditions on the men, save financial ones. Each man must pay a $925 court fee and both have agreed to split a $1,500 investigative cost  for the engineers that assessed the damage caused to the hoodoo Taylor knocked over  and restitution, which will be determined sometime in the next 30 days. 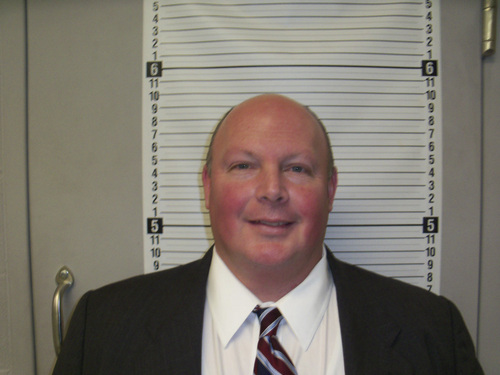 Emery County Attorney David Blackwell said the state was "close" to determining the monetary amount they would be seeking. Defense attorney Scott Card, who represented Taylor, said the amount will be "thousands, not hundreds" of dollars that will go towards erecting signs throughout Goblin Valley to warn others not to damage the formations. It was the first time the two men  both Highland residents  appeared in court since they were charged with breaking the law in January. According to court records, the men caused more than $1,500, but less than $5,000, in damage when they pushed over the ancient rock formation on Oct. 11  an incident they filmed and posted to the Internet. 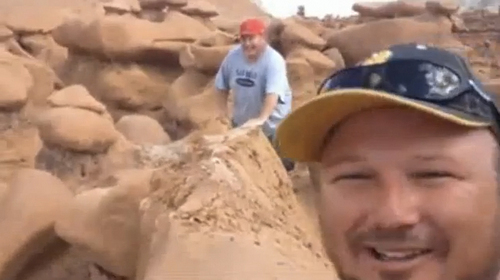 The video, which was viewed millions of times, shows Taylor pushing over the rock formation to cheers of videographer Hall and other men in the area. "We have a new modified Goblin Valley," Hall says into the camera. "A new Goblin Valley exists with this boulder down here on the bottom." Taylor and Hall have insisted they toppled the rock formation out of concern that it would fall and hurt someone, like a family they had allegedly seen walking underneath the hoodoo about the time of the incident. Hall later pointed out that his uncle was killed decades earlier by a falling boulder, causing him to be forever concerned about the consequences of falling rocks. "When Mr. Taylor leaned on that rock to rest, it tipped, so it was a concern," the defense attorney said. "The more appropriate behavior would have been to notify someone, like a ranger. They know that now." The men, who were at the state park with the Boy Scouts of America, were later removed from their Scout leadership positions. "Mr. Taylor was a long-time Scout leader who loved the boys, loved the Scout program," Card said. "He recognizes his guilt, recognizes what he did wrong, and he hopes that a message can be sent to others through his mistake that this isn&apos;t what you do." The toppling of the goblin sparked international outrage, invited death threats and prompted Rep. Dixon Pitcher, R-Ogden, to sponsor an unsuccessful bill that would have targeted individuals who damage, deface, evacuate, alter, destroy or remove features, formations, sites or geological areas owned by the Utah Division of Parks and Recreation. The bill would have provided a method of calculating the "value of a division resource" and made causing damage exceeding $1,500 a third-degree felony. But some lawmakers said existing vandalism statutes were sufficient, and a House panel killed the measure in February. Before charges were filed against Hall and Taylor, Utah State Park investigators wrestled with what value to put on the wrecked rock formation so prosecutors could determine an appropriate level of punishment. "We looked at every potential scenario for determining what it was worth," said Utah State Parks Director Fred Hayes. "We talked to engineers. We talked to geological consultants." The value that was determined for the toppled goblin, or at least the value of putting the rock or something like it back in Goblin Valley State Park, has not been publicly released. The rock will not be replaced due to the liability of a human-made formation, but Utah State Park investigators studied the possibility of reconstructing the hoodoo out of concrete or fiberglass. Due to the hoodoo&apos;s size, a helicopter or crane would have been needed to place the goblin back on its pedestal. "These were the options we came up with. It&apos;s not like you can go buy a goblin on eBay," Hayes said. "The miserable part of natural-feature vandalism is that it is virtually impossible to put a real monetary value on it." Aside from noting the absence of an order for Taylor and Hall to perform community service, Hayes said he was not surprised with the plea deal. "These are not career criminals. They did something stupid," he said. "They can end up with essentially a clean criminal record. That&apos;s the way our system is designed: to let the judge determine what is fair." Utah State Parks will continue to work with Emery County to come up with a restitution value as ordered by the court, Hayes said. Jay Christianson, president of Friends of Utah State Parks, said with no specific laws on the books addressing what to do in cases like these, it&apos;s not surprising that the men did not receive harsher punishment. "You hope it doesn&apos;t ever happen again, but there needs to be something done to set a precedent that this is not acceptable," he said. "Just paying a fine is an easy way out. There needs to be more of a penalty. There needs to be corrective action. Doing community service, people learn there is a penalty for doing something stupid. But Deputy Emery County Attorney Brent Langston believes that is the message Utah has sent in its treatment of Hall and Taylor. "I believe justice was done," Langston said after the hearing. "No body would argue that this wasn&apos;t stupid, but I don&apos;t think they&apos;ll do anything like that again. And I hope others  seeing what happened here  would also think twice." Absent an order from the court, Taylor and Hall may continue to visit the state&apos;s parks. Card said his client and Hall offered to perform community service inside Goblin Valley or other state parks  trail clean-up work for example  but state officials declined their offer. "They offered to participate in a service project of the state&apos;s choosing," Card said. "These are some good men who made a mistake. They feel bad. They want to make up for it."